A few years ago, Adam Sherlip was working with the New York Islanders hockey team and Team USA star and Olympic medalist Angela Ruggiero, coordinating their Charles B. Wang Ice Hockey Project Hope initiative, a youth hockey development program in northeastern China. Project Hope hosted a team from China to compete in a tournament against teams from the New York metropolitan area. But when Adam visited Heilongjiang Province and saw the rinks Project Hope had built at schools there, his life completely changed. "Traveling to the opposite side of the world teaching kids hockey was one of the most memorable experiences in my life to date," Adam says. "Hockey has a culture and a language that transcends borders and the differences we may have off the ice." 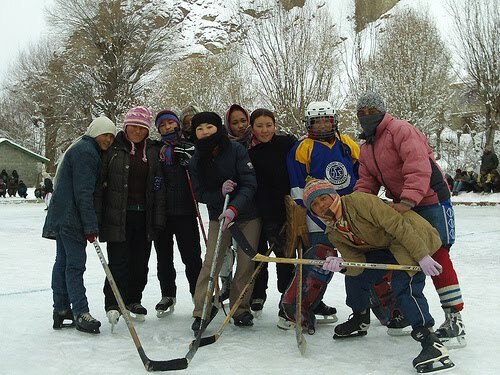 The experience led him to start The Hockey Foundation to support grassroots hockey around the world, especially in places remote to the rest of the hockey world. Places like Ladakh, in the Indian Himalayas. To Adam Sherlip, hockey is more than a game. He believes sports can help bring about social change and improve understanding between people. For those who have never played a sport, it is hard to grasp how sports change lives, but they do. Sports promote leadership and teamwork, critical thinking and problem solving skills, as well as physical activity that can improve self-esteem and confidence. Hockey, by virtue of its fast pace -- and the dangers of having blades on your feet while and carrying a big stick -- has other lessons to teach: about perseverance, coordination, and paying attention. Despite the impression given by fighting in professional hockey, the sport also teaches respect for others. Adam brought all of these things with him to Ladakh in January 2009, along with donated equipment..
Why Ladakh? "Ladakh came about from a random email from Angela that mentioned it briefly," Adam says. "And when I researched this Buddhist region and the progressive, self sufficient school there, I knew I had to be there to assist and see how they lived." He hopes to spread to other parts of the world in coming years. For now, Adam wants to return to India this fall. He's actively raising the $10,000 it will take to support hockey development for children and adults in Ladakh, a region of Jammu & Kashmir, India's northernmost region, as well as children in the state of Himachal Pradesh. It will also help support the Ice Hockey Association of India. They are also looking for equipment donations and corporate support. His ultimate goal with the Hockey Foundation? To "share happiness and change lives, one puck at a time." Now that's a real cool goal. For more on Adam and hockey in the Himalayas, including video footage or to support their efforts, go to The Hockey Foundation. You can also follow The Hockey Foundation on Twitter @HockeyFndtn and find them on Facebook.